Let Vdara help you conduct your business your way. 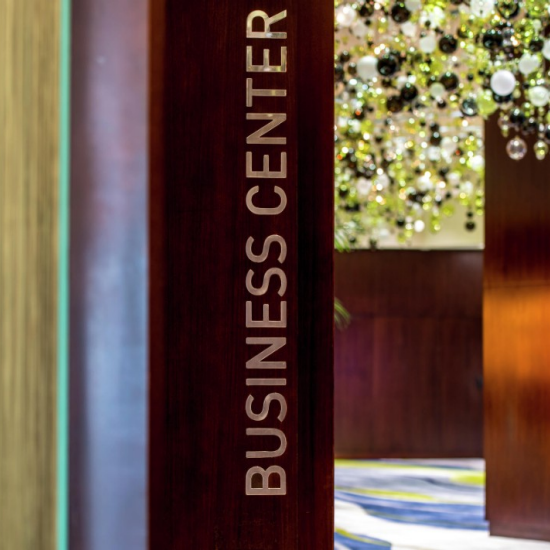 For pricing and additional inquiries please contact the Business Center at 702.590.2050 or send an email to bsc@vdara.com or review our Services brochure. Personal computers, monitors, printers, copiers and radios. All rentals require at least 48-hour advance notification and are available at daily and weekly rates. UPS and FedEx are our preferred couriers since they deliver to the hotel Monday – Saturday. USPS is also a valid courier however their Express Service is not guaranteed because parcels are delivered to a Las Vegas sorting facility before they are brought to the hotel. This can delay USPS packages by up to 3 days. Once the packages are received and processed at the Business Services Center, your room will be messaged letting you know they are available for pick up or delivery to your room. If your packages arrive before you check into Vdara, the business center will accept and store them for 14 days prior to your check in date. If the receiving date falls before this specified period and there is no record of a guest reservation in the Hotel System, then the package is liable to be returned to sender. If your package is not retrieved two weeks after you check out of the hotel a return to sender label must be provided to bsc@vdara.com or your package will be donated to charity. Handling charges are applied for freight shipments. Freight Shipment Handling charges are applied for freight shipments. Guests must provide a Bill of Lading and schedule the pick-up during business hours. Shipments picked up or delivered on Saturday will be assessed a $15.00 charge. Please be advised that there is a handling charge for the packages based on weight. The handling charge includes receiving, processing, and storing of your packages, as well as ensuring the delivery of the packages to you. 151 lbs. or more: $80.00 per 100 lbs. Presenting the perfect gift to experience the ideal balance of access and escape at Vdara. With every Vdara retreat comes every comfort imaginable. Now you can bring home a piece of the sophisticated, stylish and luxurious boutique experience with our collection of amenities available for purchase. Conveniently located at the Conference Center entrance. On the left of the registration desk follow the conference center entrance and the business center will be at the entrance on the left hand side.